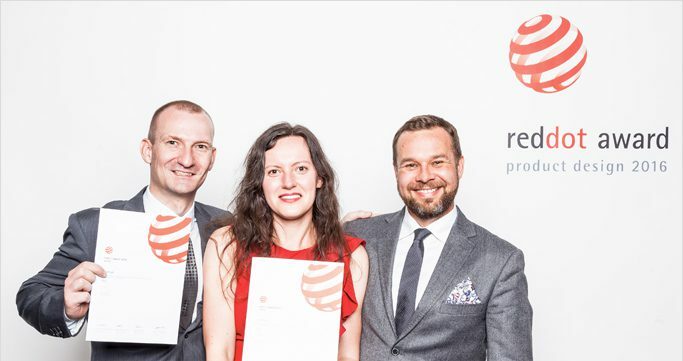 We come back with the trophy from Essen Red Dot Design Award • Poznań Marmite S.A. The building of the former Zollverein coal mine in Essen, Germany has traditionally held a Designers Night gala, for the most prestigious design awards – the Red Dot Award. This year’s event was different from the previous ones: for the first time in a small group of awarded objects was our freestanding bath tub Silvia. We are even more proud that our product will be display on special Red Dot Museum exhibition, located in the Zollverein, as an example of best international design. The prize was received personally by parents of success: designers Marta Gębska and Zbyszek Piasecki. We believe that our design team will stay permanently on the list of the top names of design world.